This is a third party addon of late models Sikorsky helicopter CH-53. It is designed for and works only in SF2 series. And will never work in SF1. This is FREEWARE-DONATIONWARE and it CANNOT be distrubuted unless permissions are granted by myself. Any persons wishing to make further modfications, contact me first. This mod represents a Late model of CH-53D with installed EAPS and auxiliary fuel tanks. I've split this model into two versions. Early with RWR blisters and AN/ALE-39 flare/chaff dispenser and late with some more blisters, new doubled CMD dispensers and ALQ-144 IR jammer on fuel tank pylons. Ant this will be the last model of Sea Stallion from me. I highly recommend to overwrite previous files decals/weapons/guns- or best is delete the old one and put new files. YOU NEED TO DELETE OLD AIRCRAFT FOLDERS CH-53A and CH-53D_70. Many things were changed and as tested Overwriting may cause some problems...So delete old ones put new ones. Small changes in ini files, corrections on fuel loadout, changes in cockpit ini. Small changes in skins. Also No longer fake weapon "no gun" is needed - thanks to The Trooper. He pointed small fix in data.ini. Added simple bump and specular maps. Also added damage tgas. FAkePilot mod neede to run this mod. This addon works with my CargoPACK (included in rar file). All of the weapon stations are made as specific station code and will work only with this cargo pack. Of course, you can edit and use any other weapons available. LANDING GEAR - Nose light deploy/retract at any speed. ANIMATION 1 - right side hatch and door. Two parking animations included one for 'on land base' and other for 'on board' parking. I'm including two vessels moded as USMC nation. (same as in AH-1J pack) so you can practice start and land. Those ships have moded catapults, deck and arresting cables in a data.ini file. Those ships are limited only to those used during the Vietnam War on WestPac/SEA cruises. You can fold tail and rotor by enabling animation in data.ini file. But it looks silly. And my intention for this animation was eye candy on board vessel. With little practice, you can even hoover. Without fake flaps and airbrakes. Important here to control is using rudder and vector thrust control. With heavy cargo load probably you need little run on A model as engines on A are little underpowered. Normally throttle vector control on 88-89 degree increase power 70% then slowly -more and more, wait and it will take off. It is possible to land on board two included ships. don't forget about a hook. New upgraded cockpit based on NATOPS manual. Fuel usage is not super perfect but compared to all previous H-53 models released here fuel gauges are working. Few differences between models mostly in humps/bumps/sensors dispensers. All serial numbers are based on available photos, and USMC documents and are historically correct. The only "offensive" weapon is left/right side gunner. Well, it is a quite defensive weapon. I am releasing this cargo load in the current condition. So maybe some skins needs to be adjusted. Cargo loads include few cargo crates for cargo bay and hook, howitzer, MUTTs. Skins for MUTTS - Thank yo The Trooper. All serial numbers, as far as I know, are based on photos and US Army docs and are historically correct. One specific folder for Desert Storm Mod Fans. including one of two units operating D model during Desert Storm. two generic paints green and 3color paint scheme. HMH-362, HMH-363 and HMH-463 operating CH-53D at the end of service of this aircraft. In 2012 CH-53D was finally retired. Due tu construction of this mod it is better to use collision and landing on NORMAL setting. On hard you may have some complications on airfield - especialy with underslung cargo load. Pilots - best to use is OldDiego's pilots. This mod still needs some work. But I am afraid that if I will not upload it, I might never fully finish. Thanks for all kind support. NAVAIR 01-230HMA-1 Natops Flight Manual Navy Model CH-53D Aircraft. Naval Air Systems Command, March 2001. H-53 Sea Stallion in Action Squadron/Signal Publications by C.M.Reed. I've just uploaded a new 3rd version of a file. Now BM and SM maps added. Small changes here and there. Read info on download page. If you have already an old version all aircraft folders must be deleted. After testing with overwrite some errors occurred. Decals/ weapons etc..are all fine. Aircrafts must be replaced. I've done a similar job to other Stallions / Jolly Giants so I will upload them soon also. This is a third party addon of Sikorsky helicopter RH-53D. This is FREEWARE-DONATIONWARE and it CANNOT be distributed unless permissions are granted by myself. Any persons wishing to make further modifications MUST remember to put everyone's name in it. This mod represents Sikorsky model of RH-53D. It was used mainly by US NAVY Mine countermeasure units. At the end, of service time RH-53D were passed to USMC reserve units, where served as transport/heavy lift helicopters. Some were still used during Desert Shield/Storm operations in 1991. Finally, RH-53D was written off from units in 1996. 12 aircrafts were also ordered by Imperial Iranian Navy. Only six delivered before the revolution. Add then all six remained in the newly formed Islamic Republic of Iran Navy Aviation. YOU NEED TO DELETE OLD AIRCRAFT FOLDERS RH-53D_70. Many things were changed and as tested Overwriting may cause some problems...So delete old ones put new ones. As always with my mods. LANDING GEAR - Nose light deploys/retract at any speed. ANIMATION 1 - right side door. ANIMATION 4 - Refueling probe - H key (hook by default) will change seat position to see a tip of the IFR probe. Normally throttle vector control on 88-89 degree increase power 70% then slowly more and more, wait and it will take off. Newly upgraded cockpit based on NATOPS manual. Mirrors working now and showing correct image. All serial numbers are based on available photos, NAVY and USMC documents and are historically correct. The only "offensive" weapon is left/right side gunner. Well, I'm straffing convoys with it with great success. Important - if there is no gunner - fake weapon (no gun/empty) must be loaded. For now, it must be this way. Same as default should be loaded Mk103 minesweep. This is allowing top cargobays to be seen. This addon works with my CargoPACK (included in rar file). All of weapon stations are made as specific station code and will work only with this cargo pack. Of course, you can edit and use any other weapons available. Here is experimental Mk105 minesweeper sled different than in previous CH-53D pack. This one is only for RH-53D. To see Mk105 open cargo bay. Also, you can add refueling probe. At the beginning of service, this aircraft has only provisions for refueling probe. I am releasing this cargo load in current condition. So maybe some skins needs to be adjusted. Cargo loads includes few cargo crates for cargo bay and hook, howitzer, MUTTs. Skins for MUTTS - Thank yo The Trooper. Due to the construction of this mod it is better to use collision and landing on NORMAL setting. On hard, you may have some complications on airfield - especially with underslung cargo load. - VR-24 World's Biggest Little Airline, Helos on COD duties. As bonus there is Eagle Claw folder -easy to find. Inside - skins for sand repainted RH-53D - also replacement file for lod and deta.ini file - this wil make EAPS dissapear. So backup original lod and data file before using Eagle Claw mod. So yo were warned. Thanks to everyone who helped me with this. daddyairplanes,331Killerbee,76.IAP-Blackbird. This is a third party add-on of early models Sikorsky helicopter CH-53. 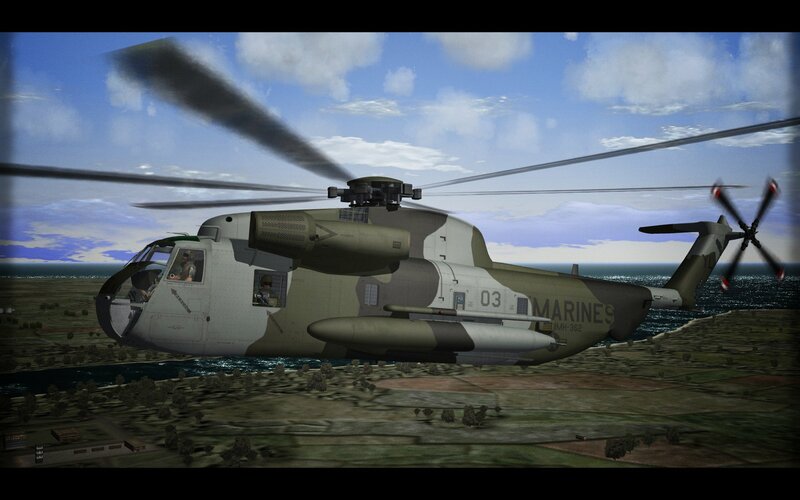 This mod represents Late model of CH-53A already with instaled EAPS and early models oF CH-53D with uprated engines. A model never received aux fuel tanks and were used until 1992. At the end of service mostly by reserve units. D model /early/ was used also until around 1992. Not every D model was upgraded so in this config they were flying until the 90s. Im including two vessels moded as USMC nation. (same as in AH-1J pack) so you can practice start and land. Those ships have moded catapults, deck and arresting cables in data.ini file. Those ships are limited only to those used during Vietnam War on WestPac/SEA cruises. One cockpit based on NATOPS manual, an early model for both A and early D model. Both models are similar. The only difference is in engine power. D model is 'stronger' so it's easier with heavy loadouts. And only D can tow 'experimental' Mk105 minesweeper. in 1973 USMC joined NAVY in operation End Sweep and equipped their D model (HMH-463 only) with minesweeping stuff. So here you can "tow" Mk105 minesweeper. It is just interim mk105. V.2 is under development. To see Mk105 open cargo bay. Due to construction of this mod it is better to use collision and landing on NORMAL setting. On hard, you may have some complications on airfield - especially with underslung cargo load. I've deleted Countermeasures from weapon loadout. CH-53A in Vietnam used by HMH-463 and HMH-361. In mid-80s A model was still in use by some units. One of the last unit to use CH-53A was HMH-772 until 1992 when they send A to AMARC. Also in mid-80s ( I believe it was in middle or late) US Navy composite squadron VC-1 was using old ex-marine CH-53A until 1992 when they send them to AMARC. I think they were using only these two aircrafts. Few paintings fro different years, early green early 80s green and tri-color mid-80s. HMH-361, HMH-362, HMH-461, HMH-461 - two schemes one - 78 from a trip to Japan and one 1973 during Operation End Sweep. This mod still needs some work. Will be working on it.